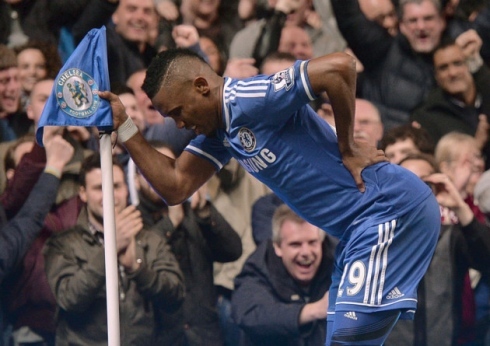 Samuel Eto’o pokes fun at stories questioning his age by pretending he has a bad back and resting on the corner flag after scoring Chelsea’s first goal in their 4-0 win over Tottenham. With all 10 teams involved in league action this weekend, there is potential for the clubs involved to make headway at both the bottom and the top of the table. There are only 2 games remaining in the regular season and top 8 teams make the playoffs. Every captain working on their best starting line-up and the best strategy. At the beginning of the season I was able to bring you my predictions, some I was certain off however some I was aware who would be a surprise as the season would progress. It was one of the busiest season for Mehboob Alidina (Commissioner), he not only dealt with trades but also replacement of players due to injuries. I won’t discuss the actual players being traded but the drastic changes it brought many teams and the standings. The top 4 teams right now are battling for the title; Chipolopolo, Harambee Stars, Bafana Bafana & Indomitable Lions. Every game is crucial for these teams as they all fight to take the league title. Chipolopolo’s captain Abdul Champsi has managed to keep his team on top with 5 draws in the season and only 2 losses. Captain of Harambee Stars, Faraaz Fazel has pulled every legal trade in the trade history book and kept his team on a winning streak. Mohammed Mandan from Bafana Bafana brings his captaincy experience from the rest while contributing as a player and managing the team. Indomitable Lions captain Feroz Mir has proved after losing key players mid way through the season he didn’t give up but is back in the race to take the no.1 spot. Surprises are always good while some maybe disappointing. I am here to touch base on Kakamega Homeboyz FC. They were the fans favourite to winning this league however due to some major injuries their team took a ripple effect. Captain Taha Ali still believes in his team and I don’t doubt they will not back down in the playoffs. They currently hold their position in the middle of the standings. Polisi Dodoma Captain Habib, had enough drags of Sheesha before making some trades. His team has definitely gained in strength with some moves however they are still in the process of establishing positioning. Taifa Stars’s Mohamed Raza Panju was very reluctant on giving up his no.1 pick however inorder to stay in the playoff race he felt it was necessary. Don’t forget he brought the Rashid brothers together. Some bottom teams who are battling for the lives. Gymkhana’s Captain Muna Najafi had some major setbacks, one of his key players Imran Virji went through a medical emergency and alhumdulillah he is recovering well. Last time I heard they discharge Imran from the hospital due to a special request of halal popeyes chicken and live telecast of the ZFC games. We wish him best of luck! Mozambique Stars captain Calbe Najarali had a decent start in the season and surprised many teams. They gained from some trades and pulled a big win against Polisi Dodoma recently. A bottom-of-the-table clash between Gymkhana and Mozambique Stars could see either of those sides condemned to inevitable relegation while Indomitable Lions could increase their lead at the league’s summit with a win over Gymkhana. Lastly we have Mogoka FC, these guys are entertaining according to TMZ.com. Believe it or not, before last weekend, they had only lost 1 in last 4 matches by a goal and all 4 teams they played were in the top half. They cannot make the playoffs this year but they will have a big say in where the league titles goes as they have to play Chipolopolo and Harambee Stars. Some great matches to watch out for in the last 2 weeks; Kakamega Homeboyz FC vs Harambee Stars – March 15th, Mozambique Stars vs Gymkhana – March 15th and the regular season ending with Indomitable Lions vs Chipolopolo on March 22nd.